Otolaryngology Update: 5th ENT Instructional Course, SGH Department of Otolaryngology,Singapore, 29 July – 6 August 2010. 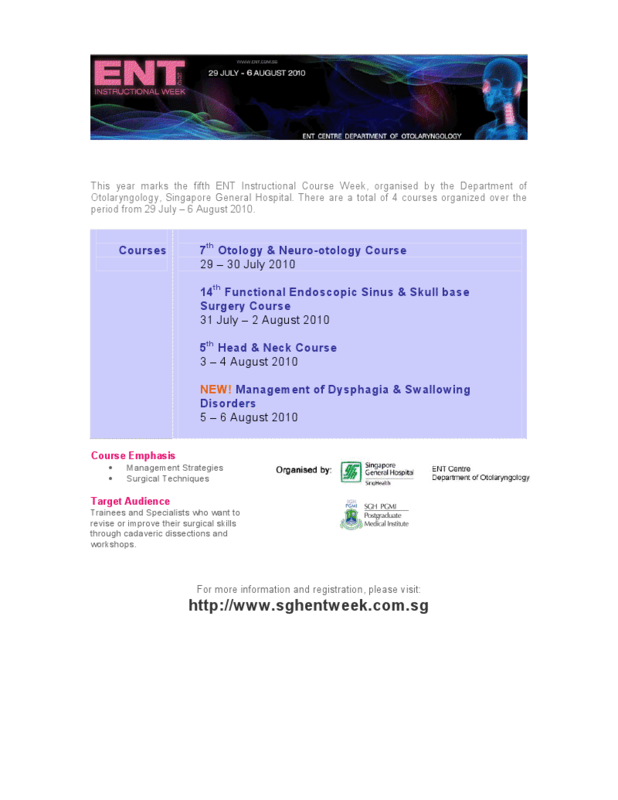 5th ENT Instructional Course, SGH Department of Otolaryngology,Singapore, 29 July – 6 August 2010. 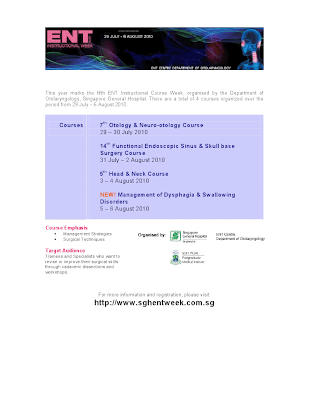 The SGH Department of Otolaryngology is organising their 5th ENT Instructional Course Week this year. The Instructional Course Week is anchored by the 3 main courses - Otology & Neuro Otology, Functional Endoscopic Sinus Surgery and Head & Neck Surgery, and also introducing a new workshop on Management of Dysphagia and Swallowing Disorders. The courses have been designed to cater to the needs of trainees as well as specialists who want to revise or improve their surgical skills through cadaveric dissections. As such, the emphasis of these courses will be on management strategies and surgical techniques. Please refer to e-flyer or visit http://www.sghentweek.com.sg for more information and registration.